I am excited to be greeting you from Zermatt, Switzerland!! I arrived here just a bit over a week ago for a three week on-snow training camp, and I’m happy to say that everything thus far has been going well! I Completed a Total of 1,387 Jumps this Prep Season! So far on this trip, I have skied a total of 5 days, as the mountain was unfortunately closed for the first 3 days of our trip due to high winds. However, I had the opportunity to explore a few places in Zermatt I hadn’t in previous years. On the first weather day, my teammates and I hiked up to Edelweiss, an old church that overlooks the town of Zermatt. On the third weather day, we traveled by funicular to a point on the mountain with an amazing view of the Matterhorn. Once up on the mountain, we ate lunch and hiked our way back down to town. On our fourth day in Zermatt, we finally made it up to the glacier to ski. Since then, the weather has been amazing — each day holds unbeatable bluebird skies and picturesque 360 degree views! For me, this camp focuses on putting my run together in preparation for the first few World Cups before Christmas in Ruka, Finland, and Thaiwoo, China! This means that for the next two weeks, I’ll focus on technically improving both my skiing and jumping with an overall goal of competition-ready runs throughout. 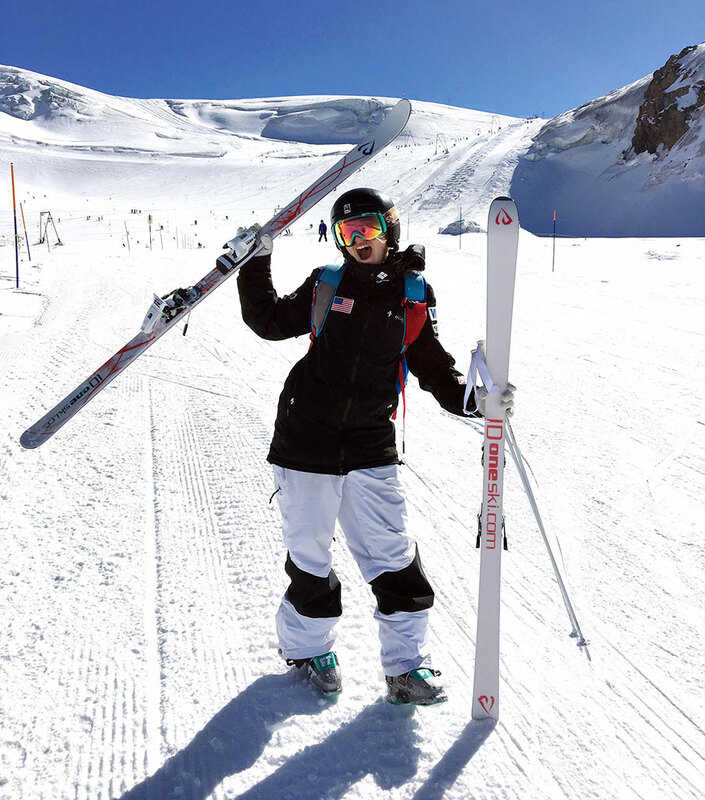 2017-18 Season Prep Training // Zermatt – 1 from Olivia Giaccio on Vimeo. One of the main reasons I love training in Zermatt is that I get the opportunity to train alongside many of my competitors. The USA, Australian, Canadian, Chinese, French, German, Norwegian, and Swedish national teams are all here training and preparing for the first few World Cups as well, along with other teams from around the world. I’m ecstatic with the way my skiing is progressing and cannot wait to see what the future holds! The competition season is steadily approaching and I am so excited to tackle it head on! Thanks again for your support — it’s helping me to both achieve my goals and have the opportunity to do so! Thank you! Thank You ID One for My Awesome 2018 Special Edition Skis!